Pragmatic Play has released a festive hit with Leprechaun Carol. Accompanying the traditional Christmas feel to the reels is a jovial leprechaun figure, whose snow-covered village is the site of his cheerful singing and lucky spins. 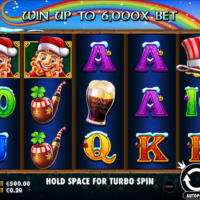 Featuring three separate reel modifiers, including a wild modifier, cash prize modifier and giant symbols, Leprechaun Carol offers players plenty of chances to win big. Alongside these reel modifiers are three enticing and engaging bonus features, including free spins, coin collector and giant symbol modes. Pragmatic Play’s portfolio contains more than 100 proven HTML5 video slots, including Ancient Egypt Classic and the award-winning Wolf Gold. These titles are now live with an expanding list of leading casino brands, including Pokerstars, Rank Group, GVC Holdings and Casumo.